Recently I got a chance to make a field visit to Bihar’s district of Nalanda to pilot the survey tools for ASER Centre’s Middle School Study. The purpose of the study is to look into the access and quality of post primary education in India. Fetched at the local railway station by the city’s special local ride called “tonga”, it was just the beginning of the many surprises which the city held for me. During my short visit to the field I witnessed the co-existence of various contrasting socio- economic elements. From pockets of extreme poverty, people from most backward caste termed as “Mahadalit”, and children plagued with malnutrition; to the booming industrial area around the city I visited, where through the barbed wires one can get a glimpse of exuberant flats with modern-day facilities. But is there anything to be surprised about this? Is not Nalanda in a way a reflection of the socio-economic inequalities present in India, with the barbed wires and gated colonies distinctly marking the boundaries that cannot be crossed? We came across children who aspired to become doctors and teachers when they grow up. But unfortunately, we also found various cases of children dropping out from school and shockingly of some who had never been inside a classroom. We met a girl who, after completing her middle school, was making ‘bidis’, at Rs. 60 for every 1,000 pieces she made. She had to work in order to support her family, even though she wanted to study further. A boy chose to drop out after studying till class 8th in a government school because on trying to get admission in a private school, he was asked to repeat three years and get enrolled in Std V instead of Std IX. The most shocking case was that of Mukhiya’s, the Sarpanch’s daughter who, for reasons unknown, was never enrolled in school. The leader on whom the responsibility of 12 government schools in his Panchayat lies was completely unaware of the responsibility of his daughter’s education. At that point I thought to myself, is it right to hold the government completely responsible for this when parents themselves attach less or no value at all to education? When we asked an elderly man who was busy criticizing the education system, “What according to you can be the solution?” with no hesitation he said, “Government should do something for us! !” I wonder if people will ever realize that improving the education system is a two-way street. The important question which remains in my mind is whether we need a new government scheme or would it be better to first work on increasing awareness among people so that they understand the value of education and share the responsibility of educating their children rather than leaving it on the government alone. The silver lining though was the “pink revolution” – children in large numbers have started going to government schools, with light pink painted buildings. 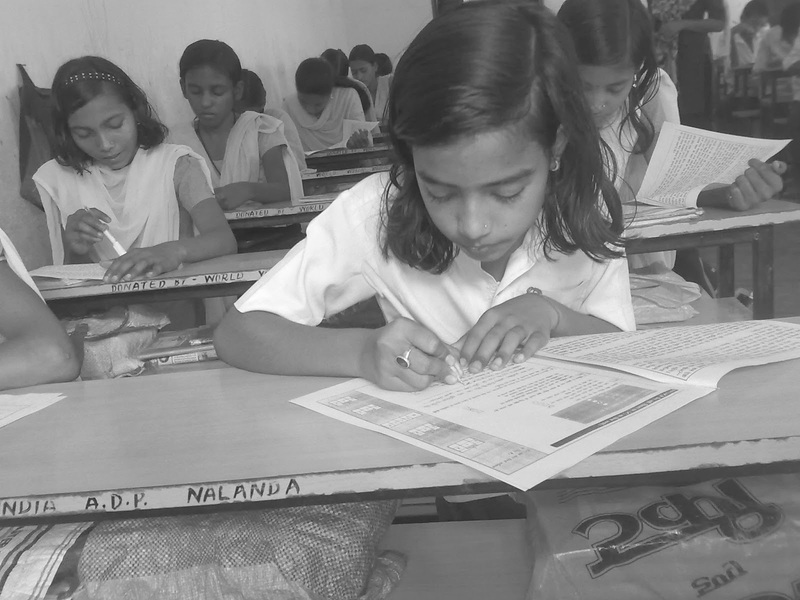 During the tests conducted for children in middle schools, it was a pleasure to see them read stories and solve the test papers with full energy and rigour. For me, Nalanda was a mix of hope and despair. There were times when the extreme summer heat and cumbersome jeep journeys would force one to give up but the dedication and the sense of purpose with which the team works always managed to raise my spirit. I still remember the first day when I stepped out of the train, I was so unsure about everything but when I met the team with assuring smiles and confident gait, I felt at home.